About a year ago a friend gave me a few pieces of fabric. One of them was a very thin green knit printed with paisleys. I thought it would be a perfect summer shirt, but didn’t have a pattern in mind, so it sat waiting to be made up for almost a year. A few days ago, looking for a quick project, I pulled the fabric out to finally make my shirt. I took my bust and hip measurements, added 2″ to both front and back, and cut out a trapezoid. I pinned the fabric together to make sure it would work, then sewed up the sides. After some more pinning I was ready to sew the shoulders. I adjusted the shoulder and side seams until I was happy, then put the shirt on inside out to draw the arm holes how I wanted them. I’m super low-tech, so I used a sharpie (which did bleed through to the front a little, but only on fabric that I planned to turn under for the hem). After that it was time to cut the arm holes, pin the hems, and turn the hems under. As a finishing touch I added bra strap guards and a piece of ribbon at the back neck center for ease of dressing. To help the cowl neck hang well I also added a bead at the center front about 1″ below the edge. This shirt only took a night and a day to make, and it looks great. I call that a win. I have a project that I’ve wanted to start for quite a while (Ok, let’s be real, I have a lot of projects that I’ve wanted to start for a while, but I’m going to tell you about one today because I’ve finally started it!). I am making a teapot cozy! But really it’s just my own weird mashup that I hope works out in the end. I’m using my own handspun as the base colour, the roof will be in a nubbly tan, the door will be dark green, and the windows will be grey. I figure embroidery cotton will make up the rest. If this works out it may be my favourite thing ever. This year was my first participating in the Tour de Fleece, and I have 3 finished skeins (and a partial bobbin) to show for it. This is both more and less than I expected to spin. Less because I thought I might spin 5-6 skeins in total, (and I might have, except the Carbonized Bamboo is not as nice to spin as wool) and also because the white Southdown skein was almost finished before July 1. More because of how quickly the Sunset skein spun up (Note to self: fat singles spin up quickly!) and because of how much of the Carbonized Bamboo I got to. In comparison, the silk bump for my Rumpelstiltskin yarn was the same size as each of the 2 bumps of Carbonized Bamboo, and I spent 4 months on Rumpelstiltskin. So that’s that: Tour de Fleece is over. Now what to do with all this handspun? Last week my husband and I visited some of my relatives a few hours away from where we live. We packed up and set out on our journey. We stopped in the lovely Asheville, NC for lunch. As we were exploring we came upon a yarn shop and my husband encouraged me to go in (he is a keeper). That’s 3.1 oz of Merino combed top and a skein of Viking Raggen for man gloves. What else do you expect when visiting a yarn store? We made it to my family’s house mid-afternoon and spent the evening talking and visiting. When it was time for bed I was surprised by the most beautiful quilt. The next morning we explored my uncle’s garden, picking beans and learning how to dig potatoes. It is super hard work. I spoiled quite a few potatoes finding that out. We had a picnic lunch with more of the family that came by to see us. We even had an unexpected visitor! My husband was tired from digging potatoes, so he took a nap. He had a lot of fun playing with the dogs. As the afternoon waned we got ready to come home to the city. This sock has a lot of good memories knit into it now. I set my Fibonacci Blanket aside a few months ago when I ran out of yarn maddeningly close to the end of the square. It sat in the naughty corner for a while, until I finally ordered another skein of this colour so I could get on with the knitting. The yarn came in, but the dye lot was more different than I expected. I pulled back a few rows and striped the original yarn with the new dye lot. Learn from my mistake: ALWAYS buy more yarn than you think you need. Any guesses what the next colour will be? 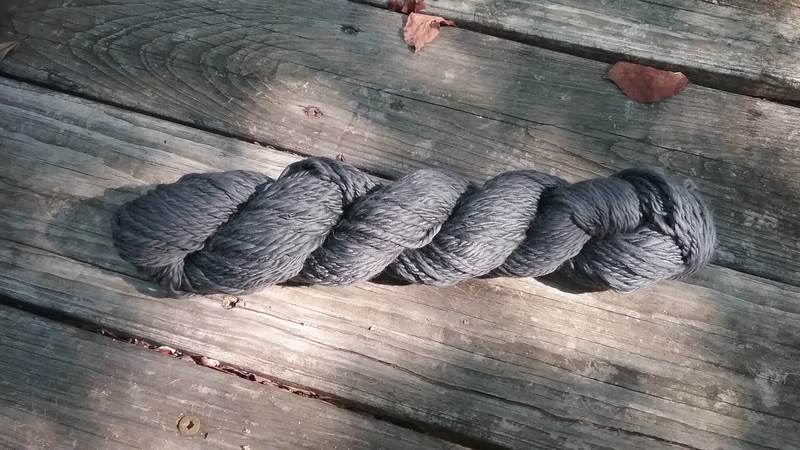 This is 150 yds of chain plied carbonized bamboo. Let’s see how similar I can make the second skein. Over the last two weeks I have been quietly working up a hat pattern. I made a similar hat a few years ago, but this time I’m making it better and writing it out. I decided to try my luck by submitting the pattern to a magazine. Designing for free is nice, but I like to get paid. And even more important is the exposure a magazine could give me. So yesterday I worked like a fiend to get all the required information together, and I submitted my pattern just before 10PM. This morning I got an email that the magazine wanted to use my pattern. I’m so excited I could scream! I’m going to be published in Knotions Magazine. The Call Box Hat will be published at the end of September in Knotions Magazine. I couldn’t be more chuffed! Posted on July 17, 2017 July 17, 2017 Categories KnittingTags Doctor Who, knitting, knotions magazine, TARDIS5 Comments on Guess What!